Google will now allow you to share some of your purchases with friends and family.
" Friday night is movie night at our home, and my wife and I look forward to our weekly ritual of putting the kids to bed, getting some takeout, and catching up on our movie wishlist. Whether it’s making the BLUE STEEL face from Zoolander, swapping tips on playing Monument Valley, or reading Dragons Love Tacos to the kids at bedtime, these shared moments bring us closer together. This is a cool concept, and I'm looking forward to checking it out. 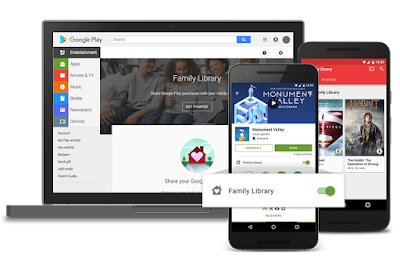 I already have a pretty large library of content under my google play account and now I can share it with my family with out having to give them my Login info. This is definitely a good move by google.